Over the past few months, there has been a lot of discussion regarding the use of paclitaxel for the treatment of peripheral arterial disease. We want to share with you our perspective and some important information on this topic. We are committed to gaining a better understanding of the recent information regarding paclitaxel-eluting devices. We are sharing data we’ve gained over the past 20 years researching paclitaxel and developing Zilver PTX, including information on safety and effectiveness. Cook’s paclitaxel-coated stent was approved by the FDA in 2012 through the premarket approval process. FDA has provided guidance to healthcare providers. On March 15, the FDA issued an updated letter that outlines current recommendations to healthcare providers who are making treatment decisions about paclitaxel devices. We recommend that you follow the FDA guidelines. A full version of the letter is available at www.fda.gov, and includes the following recommendations. Continue diligent monitoring of patients who have been treated with paclitaxel-coated balloons and paclitaxel-eluting stents. When making treatment recommendations and as part of the informed consent process, consider that there may be an increased rate of long-term mortality in patients treated with paclitaxel-coated balloons and paclitaxel-eluting stents. Discuss the risks and benefits of all available PAD treatment options with your patients. For most patients, alternative treatment options to paclitaxel-coated balloons and paclitaxel-eluting stents should generally be used until additional analysis of the safety signal has been performed. For some individual patients at particularly high risk for restenosis, clinicians may determine that the benefits of using a paclitaxel-coated product may outweigh the risks. Ensure patients receive optimal medical therapy for PAD and other cardiovascular risk factors as well as guidance on healthy lifestyles including weight control, smoking cessation, and exercise. First, there is large variability in the risk estimate of mortality due to the limited amount of long-term data. Second, these studies were not originally designed to be pooled, introducing greater uncertainty in the results. Third, the specific cause and mechanism of the increased mortality is unknown. Cook is collaborating with FDA and other global regulatory agencies. We are working to provide answers to questions from the FDA and other global regulatory authorities, including providing patient level data. The FDA has also asked industry to collaborate and present at an FDA panel meeting in June. Cook is helping lead the industry-wide working group that is preparing data for presentation at this panel meeting. We are also collaborating with medical societies and have been sharing our data to provide a deeper understanding of our mortality analysis. Information about Zilver PTX data. There has been a lot of discussion in recent weeks and we realize that you are striving to make the best decisions for your patients. We want to provide you with facts and information about Zilver PTX, our clinical trial, and the resulting data. Trial Design:The Zilver PTX RCT had a unique trial design. The RCT included a primary and secondary randomization, as well as an opportunity for patients in the PTA arm to cross over to treatment with Zilver PTX after experiencing a target lesion revascularization (TLR) in the first 12 months. 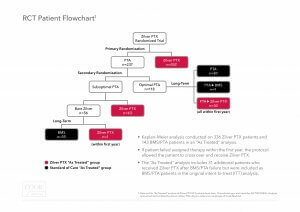 As a result of this trial design, 40% of patients who were initially assigned to the PTA arm were subsequently treated with Zilver PTX. In total, 70% of the patients enrolled in this trial received a Zilver PTX stent. “Intent to treat” versus “As treated”:To appropriately analyze the role of paclitaxel on mortality, it is important to compare all patients who were treated with Zilver PTX to those treated only with non-drug-eluting devices. The “intent to treat” analysis shows a 5-year all cause mortality rate of 22.1% for the Zilver PTX primary randomization arm and 15.3% for the PTA primary randomization arm (p-value = 0.04). 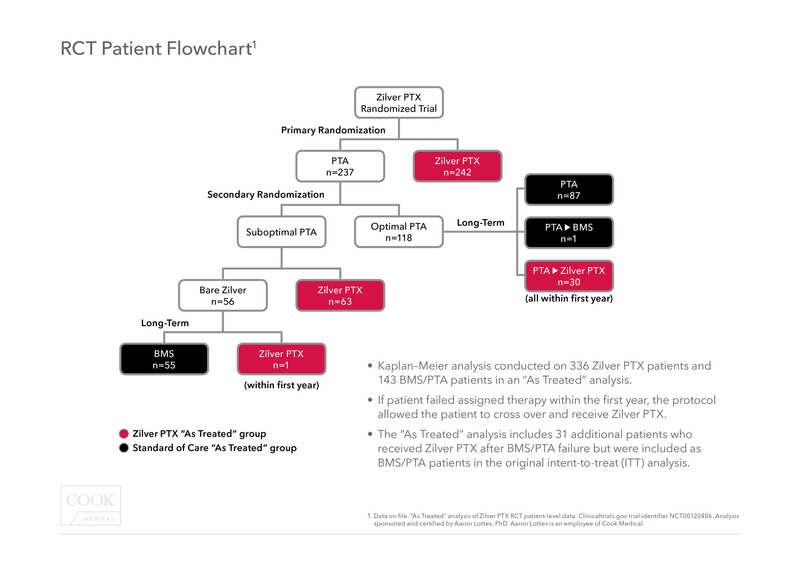 However, this analysis does not recognize that 94 of the 237 patients (40%) in the primary PTA arm were actually treated with a Zilver PTX stent yet analyzed as PTA patients and not Zilver PTX patients in this intent to treat analysis. The “as treated” analysis shows a mortality rate of 18.7% for Zilver PTX patients and 17.6% for PTA/BMS patients (p-value = 0.53). This “as treated” Zilver PTX group includes all patients who received a Zilver PTX stent. Cause of death: Causes of death were examined between the “as-treated” Zilver PTX and PTA/BMS groups. 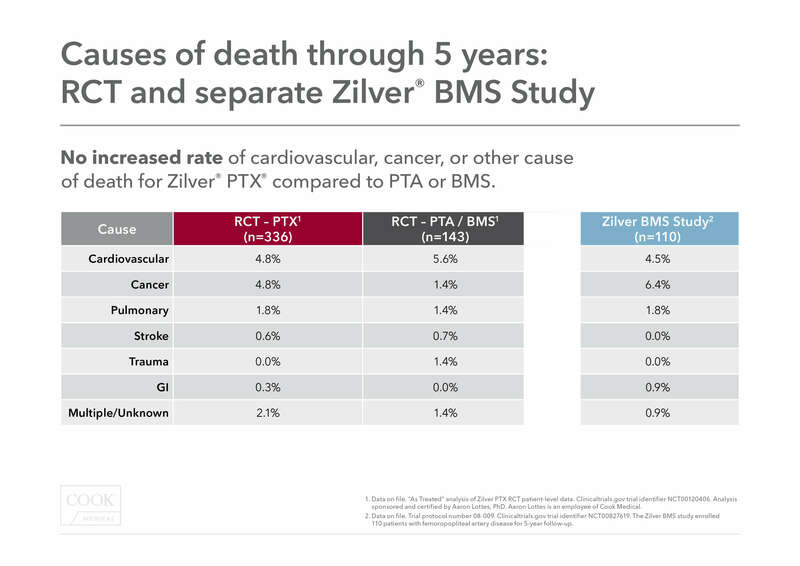 There was no increased rate of cardiovascular, cancer, or other cause of death for Zilver PTX compared to PTA/BMS. 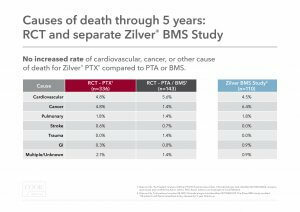 Results from our “as treated” analysis show no statistical difference in mortality for the Zilver PTX group and for the PTA/BMS group. This chart shows the 5-year cause of death. Cook is committed to serving patients and clinicians. During this time, we are committed to supporting our customers and to responding to the questions and concerns of medical societies and regulatory agencies. We will continue to share what we’ve discovered from our research and data in the area of paclitaxel. If you have questions about Zilver PTX, please contact us at zilverptx@cookmedical.com, and a member of our team will respond within 24 hours. You can also visit cookmedical.com for additional information.